I would like to improve the way I manage my business. I started sewing professionally when my daughter wanted to study for her Associate Degree. The sewing helped us to purchase books, and other necessary items needed at the time. One years ago she got her certificate. During the above period, no accounting books were kept since most of the money that came in went towards her studies. She is working now, and I am at a loss as to how do I continue this business? Should I start over? What procedures should I put in place? How can I take this business to the next level? Can someone recommend a book that I can use? What is automated processes? The advice I have got from experienced colleagues is that you either you go for quantity or quality. That is, you have to make up your mind if you want to make more garments for a lower profit margin or few garments with a higher margin. If you you go for quality, you have to accept that it is difficult to find people who are well trained to do high end work. Your business will grow slowly, and you just have to give up trying to make lots of garment and just put your effort into making a small number of high end garments for an exclusive clientèle. A tailoring workshop will have only a few specialised workers eg a finisher, a trouser/skirt maker, a coat maker, and you should work as the cutter plus superviser. I am sure there are dressmaking equivalents - I have heard from Claire Shaeffer that the Parisian haute couture houses have separate sections for bespoke tailor and couture dressmaking. If you have overseas visitors with money, target these people if you can offer a suit (or dress) for a more competitive price than they get at home. In many major cities a two piece man's bespoke suit can cost between $3000-8000 depending on the cloth. A ladies' suit should cost more, but women are oddly less willing to pay high prices for tailored clothes than the men, but will handsomely pay for high end dressmaking, especially wedding dresses. Don't make your prices too cheap or cut corners. Get in the best books with the most expensive cloths in them from well recognised firms eg Holland & Sherry, Lora Piana, Harrison's, Lesser's, Scabal, Dugdale. Get in the finest silks etc for dressmaking from Italy. If you go for quantity, you need to invest in a quality workshop for manufacture. The number of styles must be limited. You might even want to set yourself up to do made to order garments based either on a CAD block or your own graded blocks. For tailored garments, you should either fuse your fronts or use a roll pick machine for the lapels and a zig zag stitch for the chest. Also offer ready to wear with in house alterations. Like Sator said, you must pick one approach (i.e. quality or quantity) and shape your business around that. If you need to establish a baseline of revenue, alterations is a good way to do that - but, only if you're getting the alterations work from a strategic partner (e.g. dry cleaner, department store, boutique, etc.) in a quantity and rate that makes sense. If you do alterations for the public, you will (forever and always) have to offer alterations service to the public. So, weigh that carefully. Once you standardize the alterations process, you can delegate it down to a junior worker and promote yourself. Effectively, you have to engineer the layers of service you want to provide and develop a plan that allows you to hire staff incrementally. If you are starting a manufacturing business (even one that specialises in made to order garments), it is hard to start with. The initial expenses are going be high. It's like starting a factory. Keep in mind that you going to have to compete with other manufacturers many of whom off shore production. You can find yourself in a situation where you have to work really hard to sell enough production units to make a profit. What I have been taught by really experienced people is that you need to really make a commitment for either quantity or quality. You don't want to be caught in the middle of nowhere. You need to differentiate your product. Either you make your product economical or you need it to be properly high end. This is lengthy and involved. So, I can only cover a tiny bit of it, here. The equipment you use to make shirts and silk gowns is different than what you use to make a coat or sportscoat. In truth, it's only a matter of changing out the feed dogs and using a coarser needle for the heavier products. But, you have to take the machine out of operation, change it over, re-tune it, and then put the new work on it. It takes 20-30 minutes to convert the machine, which means you have 1 or 2 employees sucking up payroll while the machine is out-of-commission. It's more cost-effective to own two machines. So, one aspect of standardizing means that you limit the products you work on based on the equipment/configuration/skill you have. You can expand over time. But, you have to balance revenue and profit - that's the nature of operating a business. If you do too many different or unrelated tasks, you'll work much harder for your revenue and generate waste (in the form of time and materials) which dilutes your profit. If your goal is to turn around your business, you have to make hard business decisions. As a rule, any activity (i.e. process, product, policy, etc.) that doesn't generate revenue or ensure the greatest amount of profit is retained, it needs to be considered for elimination. When I first walk into a shop, I look in the trash bins and the stock area. You'd be surprised how often I see multiple rolls (with dust on them) of dozens of interfacings when only 1 roll each of 3 types are required. You'd also be surprised that I see many partial half-width bolts of interfacing purchased from retail stores that cost nearly double what 1 roll from an industry supplier would cost. Sewing "fast" is a relative term. I interview & audition stitchers, frequently. I have people who claim to sew fast that cannot complete a single 3-panel unlined a-line skirt (4 darts, a zipper set, 3 seams, a blind hem and a bound waist) in an 8-hr workday. I have operations and equipment standardized to the point all the stitchers need to do is pick up the bundle, move the garment through 4 machines, then finish press. When I setup the machine bay then sewed the first sample, I completed the garment (and, setup) in about 15 minutes. I set piecerate based on 25 minutes per unit, meaning 12 units should have completed inside 6 hours. This bloke worked for 24 hours and only got paid for six pieces (I made the other six after he left on day #3 because I had a deadline to deliver). He was unhappy with his payment; but, he now knows that I mean what I say. Whether he returns to work another day is another matter, entirely. If I didn't have operating standards in place which made his job that easy - in this case, a clear division of labor - then I would not have been able to manage his performance or know that I needed to assign another resource (in this case, me) to catch up the job. 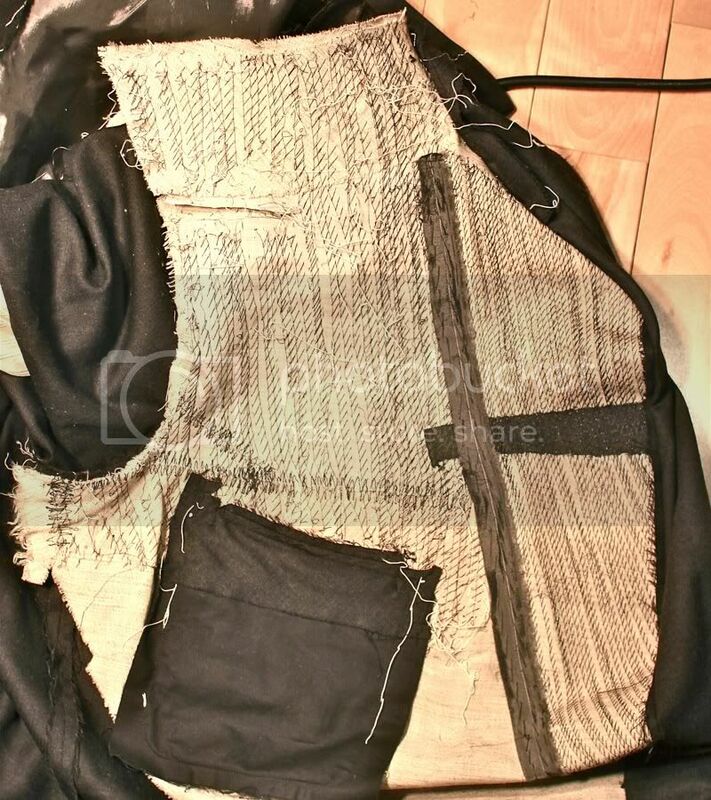 RE: lapel padder. I have the exact same model as SG, except I use a pedal instead of a knee lever to open the feed mechanism. They charge about three thousands Euros or more for this bespoke work. So if you can keep your prices from a small "cottage boutique" workshop down so that your prices are a quarter of this or less you can make a living making for travellers to your shores. Tailors in Hong Kong and these days places like Thailand are well known amongst tourists from Europe, US, Japan etc as destinations to have a suit or dress made for a reasonable price. You will have to advertise where tourists go, if you are in a tourist area (I notice that you are in Trinidad!). The advantage of this small workshop approach is that there is no pressure to manage a large number of employees, and it costs much less to set up. You only need a couple of good quality workers in your shop. For some work you can even allow employees to work from home. In Italy many women make buttonholes from home working as finishers. However, in many cases workers will sew a coat, skirt etc in their own home. Rather than relying on an investment in business infrastructure you rely on your knowledge and artisinal skill in cutting, sewing and fitting. It is a lower risk approach. In many countries small goods stores are dying out. They can't compete with the big supermarkets selling milk and bread. However, delicatessen's are still there, because a small family owned delicatessen will always offer a more personalised boutique product than the supermarket - who can't compete with this. The point is if you are a small shop don't even try to compete with the big manufacturers. I have seen people start with grand dreams of having a big business employing dozens of workers. Then they find that this is too hard to set up. So they then stick to selling through a small shop but making a mass production grade garment from a small cottage. This is a formula for disaster because you are trying to compete with large scale manufacturers who can turn out many more garments per unit time and for cheaper than your little shop can. It's a big mistake! If you are sticking to a small cottage scale production keep the quality high rather than trying to compete with big companies mass producing in China. If you want to try the small "delicatessen" approach start by taking good photos of your work. Post in this forum along with your address and contact details, expected turnover time etc. If your work is good enough, you will be amazed how powerful a tool the internet is for generating business. You will get tourists making trips with you scheduled in as part of it. You may want to start your own website or blog too. The internet is the new word of mouth. I think the revenue stream of tourists would be weaker than subcontracting to manufacturing companies along the southeast seaboard (e.g. Miami, Ft Lauderdale, Savannah, etc.). There are specialty retailers and sample rooms who need one-off garments cut & sewn. The rate of exchange/cost-of-living can be a marketing advantage, provided the craftsmanship is in-line with the market/pricepoint. Designer-quality garments are produced in small, highly-variable lots. The concept of near-shore production has "legs". But, as you say: it cannot be "big box scaled down" - it must be designer-grade workmanship. As far as revenue projections go, a highly-regarded, well-managed and well-marketed shop with 3 or 4 employees working on products for the bridge or designer pricepoints can bill the equivalent of about $300K per year. But (!) the shop needs to hum at a fairly quick pace. You will need to turn out 6 to 8 completed samples per day, or about 12-20 production units per day (e.g. 3 fused coats per person per day; or, 5 trousers per person per day). - the income generated by a new employee should be a least twice his pay (in France, it is 2,5 x pay, and that is a bare minimum). When you add his pay, the time you spend managing him, his workspace, taxes off the income, and so long, the balance point is around that. I've started several businesses in my life, I tried to do better than that (I learned this rule of thumb while in business school), and learned - the hard way - that it is a good rule. - when you hire someone, you should have at least 6 month of pay in cash, because between the time you start paying him and the time his work gets you some will money, it will be at least 6 month. This time can be adjusted taking in consideration the delay your customers pay you (I've worked for some business customers who paid 6 month or even more after I've sent my bill... and a friend of mine has done business in middle east where he was paid 2 years later... you need a lot of cash to be able to do that). I've found it hard to go for less than 6 month, and never when it is your first employee, because you will need time yourself to adjust your workflow to not working alone and make the better of being two. Do not underestimate the risk of hiring, lots of successfull businesses fail after (and because of) their first hiring. Several of us here have business experience. Do not hesitate to send us your business plan (in private), so than you can give you more precise advice. From my part, it will be a pleasure. @Saveira. The problem you describe is scaling your business. You need to focus on narrowing your service offering (i.e. you can't do suits and gowns - don't even try), standardizing work processes and establishing fair rates and pricing procedures. Then, you can hire staff because you can tie performance criteria to your pricing model. Said another way: you cannot delegate work until you've automated the processes to the point it can be managed. JCSprowls gave you very good advice. I learned that you cannot delegate what you do not master, because you have to manage the work done and solve problems the deleguee may cause. Whoops, I am speaking Germenglish. Yes, lapel padder it is. In German, Strobel call the process "rollpikieren" (roll "picking"), but proper English is roll padding. I never have figured why the Germans talk about "pikieren" (-ieren ending means it is a foreign word, in this case probably from the English word "pick", just as "blogieren" comes from "blog") to say "padding". Hi Sator, blogieren is not really a German word - where did you read that? And are you sure that -ieren always means that it it is derived from a foreign word? Edited by le.gentleman, 13 June 2010 - 04:18 AM. Whoops you are right. It is irregular in that "to blog" becomes "bloggen", just as "to stop" becomes "stoppen". I could find endless borrowed -ieren verbs, but I struggled to find ones that are German and could only find "verlieren", "frieren", "schmieren" and "buchstabieren". I thought of "probieren" too, but even that comes from "probare" according to Duden. Even "spazieren" comes from "spatiari" and "polieren" comes from "polire". The verb "wattieren" (to canvas) however does come "Watte" which Duden says is originally a Dutch word for cotton padding. According to Duden and another online source, "pikieren" comes from the French verb "piquer", with the spelling Germanicised like "retuschieren" from "retoucher". "Pik" comes from the French word "pic" (point) and is obviously related to the English word "peak", as in the peak of a mountain, also meaning a "point". However, why the English word "to pick stitch" means something so different to "piquer" and "pikieren" is beyond me. A few German tailoring words come from French eg die Taille/la taille which is Germanicised into "taillieren" (the French would probably say "cintrer", as the word "tailler" means "to tailor a garment" rather than "to make waisted"). 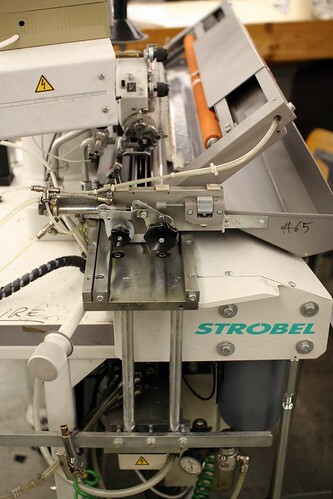 First: That Strobel machine is the same model, but not mine. Somebody offers it on the net. Second: That Caraceni was not pad stitched using such a machine, the rows of stitches are too close and there is no real roll in it. Third: Pike is a sort of long spear, which was widely used in Europe until shot guns came up (the basic weapon of new soldiers who didn't have a sword or a horse). And since there were many mercenaries around it is highly possible that the words and meanings influenced each other differently in different countries. So "pikieren" could as well mean "anstechen", which pretty much describes the process. I used to work for a master tailor in Bremen who made his living by doing alterations for some clothing stores and by making (catwalk) samples for clothing companies. He had a set of very nice Juki industrial machines with servo-motors plus a few other specialised machines. He worked in the garment industry before setting up his own shop, so he had experience in that sector, too! Although he was the last remaining full bespoke tailor (and a good one) in all of Bremen he hardly had any bespoke work. He sold MTM coats and a few shirts. One of his problems were the old fabrics he had in stock, taken over from his former employer along with the shop. Shortly before he retired he marked them down to half price, but even then nobody wanted them. Funny, today he could have sold them to those looking for vintage fabrics and designs. Saveira, if you want to have a decent bespoke shop you have to keep out the ones who try to make a bargain, both with alterations and new garments. You could have the biggest sign on Trinidad saying "bespoke/ custom atelier, new clothes only, no alterations! ", but be sure that the first ones to pop in will be some cheap folks asking for even cheper alterations of clothes from happier times. Another question is whether you want a seperate workshop in town centre or want to work at home. According to a rather old German booklet many tailors made the mistake of not being located where the customers are because they wanted to save money. According to the authors it would be better to have a shop (even a small one) in town centre to attract the customers with money. You might also try to get a partnership with a shop selling or at least displaying your stuff for you. Make sure to leave a hint about serving all figures. If the majority of Trinidad women are shaped like most of the German women nowadays that will get you work. What is the average income on Trinidad? Will be important for setting your prices. Too high and too low will likely affect the type and amount of customers. I looked "pike" up in The Shorter Oxford Dictionary. The word "pike" meaning "a pointed summit" has Scandinavian origins from Norwegian "pik", pointed mountain. The weapon "pike" comes from the French "piquer" "to pierce/puncture" from "pic", meaning "pick". So "pikieren" in tailoring meaning "to pad stitch" comes from the French word meaning "to pierce". It is true that it is a piercing stitch. I love this forum so much, that I did not log on for a few days, and I felt that I missed my family. Anyway, my daughter advertised some information on FaceBook for me. I received some calls from her friends re: sewing bridesmaids dresses. Via email, I arranged with the customers and I made 5 dresses for one customer, and 2 graduation dresses. I was complemented on both occasions. My prices are as follows: Fit and flare dresses = $350 TT dollars, Straight Corset/Strapless Dresses = $300 TT dollars, Basic Work dresses $120 TT dollars and Casual/Simple Dinner dresses $200TT - $250 TT dollars. These prices are very cheap in comparison to others but I consider myself separate as I charged the amount that I feel will cover my expenses and what I feel comfortable with. Right now, I am trying to change my thinking and how I see things in the business arena, I know I can do with help from the best masters in the sewing arena.